What does it mean? “One for all, and all for one”!. I’m sure many of you recognize it by now. 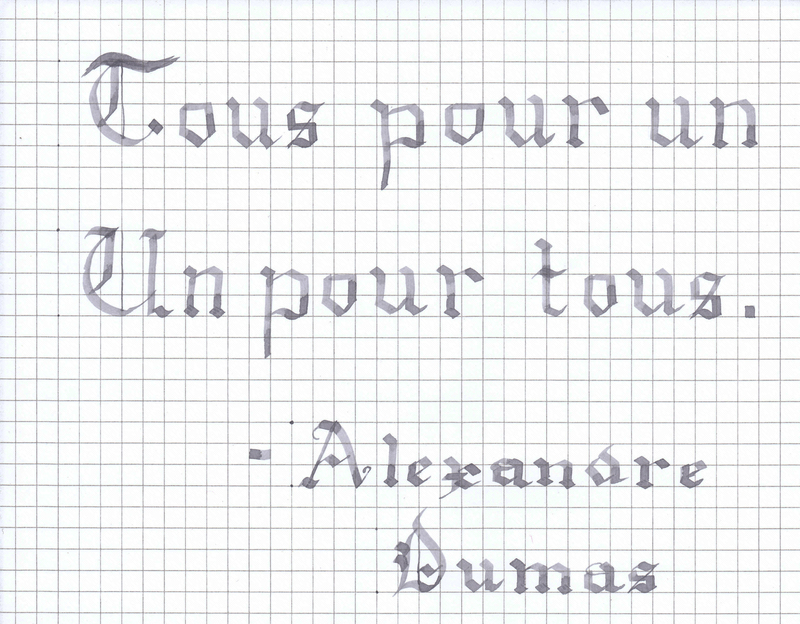 It is from a classic novel I read when I was a little boy, Three Musketeers by Alexandre Dumas. I once got my hands on an 1893 two-volume set, in an unassuming book store in Ashland, Oregon when I attended the Shakespeare festival in 2013. The owners were kind enough to let me read through both books for a song. What do I mean by that? Quite literally, I had to sing them a Beatles song, and then they let me read them. It was well worth it though, and the experience of turning the pages on those masterpieces was something I will cherish for a long time. As you see in the picture, the ink honestly felt like water when writing. 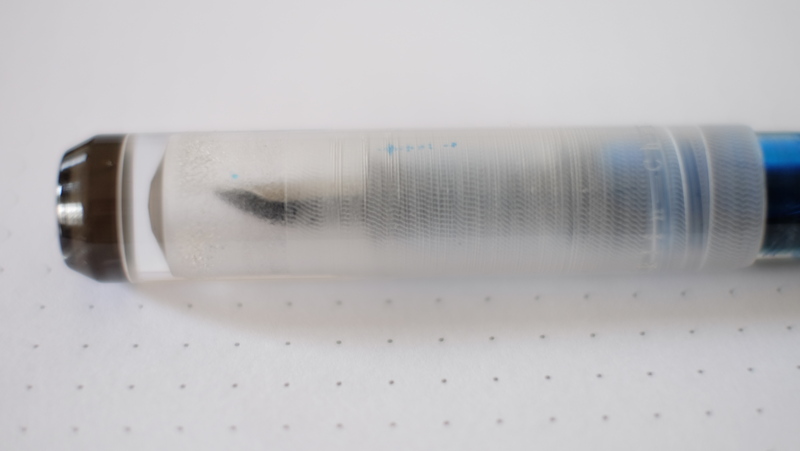 It had none of the properties I see in my other inks, and most noticeably, the color doesn’t immediately show when the nib goes along the paper. I noticed that on downstrokes, the pool of ink at the bottom of the letter spread upwards and sort of “filled in” the rest of the line. To get a good image of what I’m talking about imagine this. There is a line of water on a page. You touch it with the nib of an inked pen, and the color spreads upwards in varying shades. Just look at some popular calligraphy videos, and you will see this technique in action. One of the most annoying things about this ink is the shading. While it is a beautiful shade of grey, it doesn’t feel good for me when I write. Due to the unique shading tendency I mentioned above, while cool, it results in an uneven shade for every letter written. You can see in the scan above how volatile the shading is. On the cursive writing sample, only parts are darker than the rest, on the actual review, the shading varied every letter, which can be painful and confusing to the eyes. Overall, one could technically use this on a daily basis. Only on Rhodia/equivalent paper, otherwise it’ll feather like crazy, regardless of nib size.One cool application I can think of would be a Gothic calligraphy video which uses the snake-like shading property of this ink as a unique effect on the letters. Otherwise, stick to another, dependable grey, of which there are many out there. There was once a boy, who had a big dream. 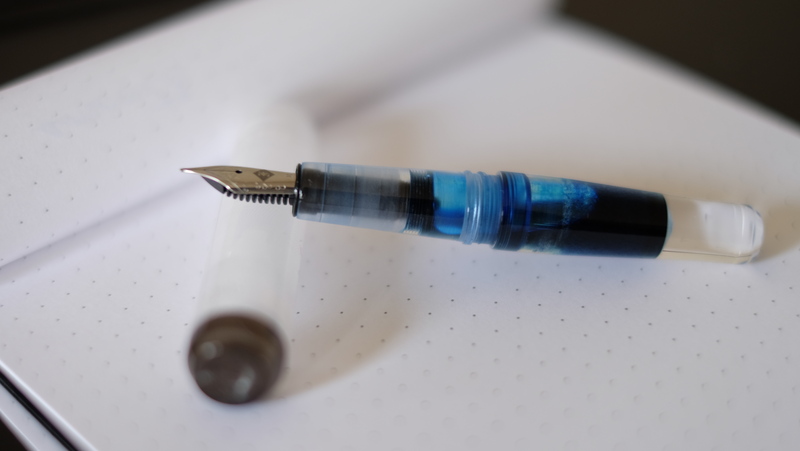 His dream was a to get a Model 40P from Franklin-Christoph, so he set out to pursue this goal. Knowing his wallet was crying out in hopelessness, he traversed the internet for a solution. That solution came in the form of a group buying site known as Massdrop. 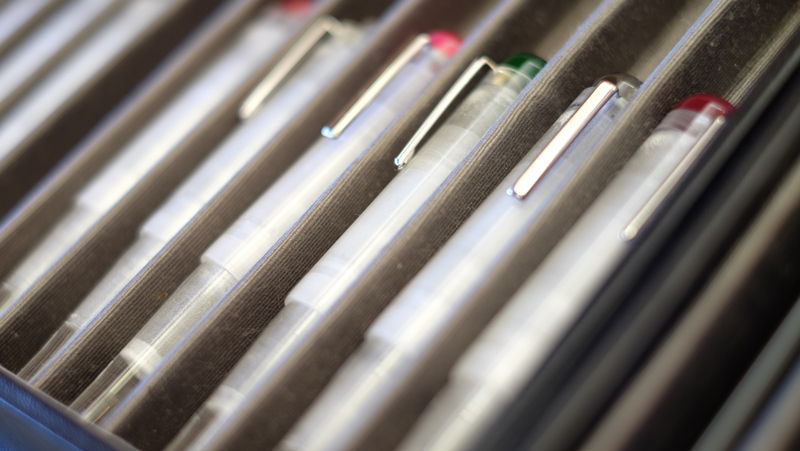 A sense of jubilation rose through him as he started a poll for Franklin-Christoph pens. However, he needed 200 votes, and his only counted as one. The road to 200 seemed like a long and arduous journey. 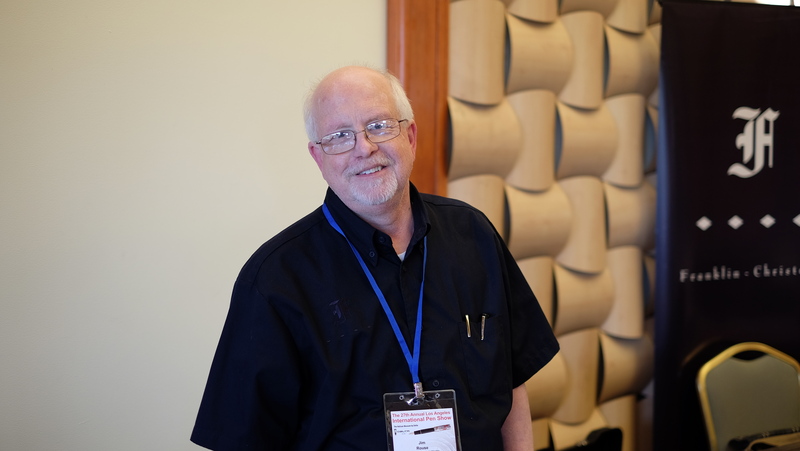 He spread the word, hoping to get more votes, and steadily as the days went by, the number of votes rose. Within 2 weeks it had passed 200! The boy smiled, at the winning choice, his dream pen, the Model 40P. 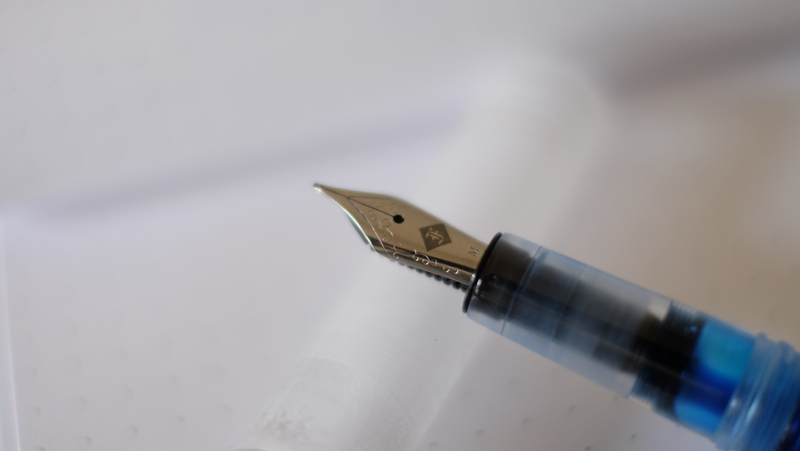 Patiently, the boy waited to see whether Franklin-Christoph would be able to accept the demand for the pens. 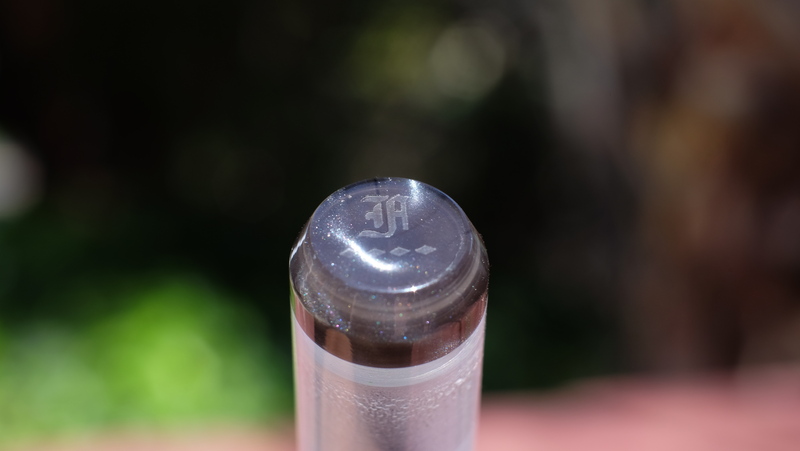 Alas, it was not meant to be, as instead of all 3 top choices, Franklin-Christoph chose to provide the Model 27 Collegia. Heartbroken, the boy was faced with a choice. Forget about the pen, and get something within his price range, or work hard and earn it. He ultimately chose the latter, and after half a year of saving, he finally had enough to go to the L. A. Pen show. He ended up buying the pen of his dreams, and now he’s going to review it. I love that script! Simple and elegant branding. Beautiful. Stunning. Simplistic. These are the words I think of whenever I see the Model 40P. The P in the name denoting that it’s a pocket-sized pen. While I haven’t yet used it as one, I am sure that it would work out fine. I first saw this pen on Fountain Pen Network, and was instantly smitten with its understated beauty. 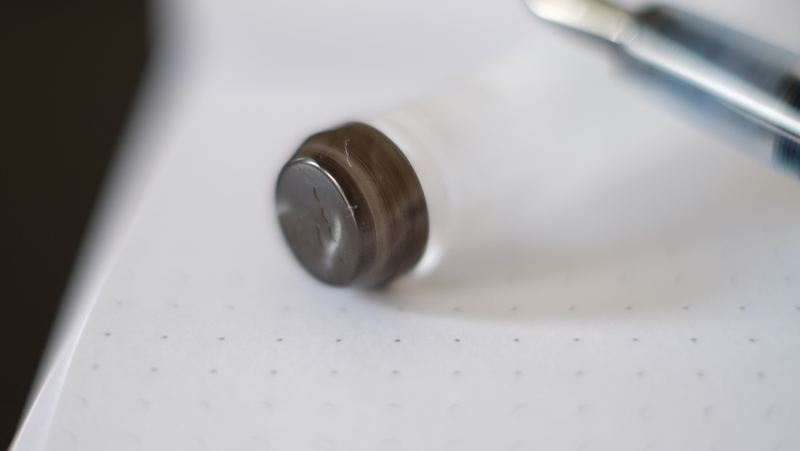 No fancy gimmicks, just a simple, acrylic pen with a dark grey finial. 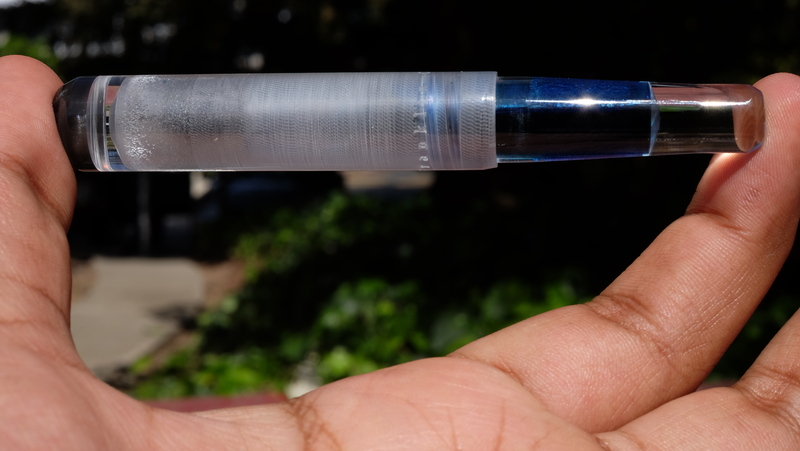 It accepts short international cartridges, but can also be used as an eyedropper, which this pen begs to be used as. This makes an amazing eyedropper. Pictures don’t do it justice. For the nib selection, it was a no-brainer. I had already known I wanted a Masuyama cursive italic. It was just a matter of medium or broad. After extensive time with the tester pens, I knew the medium was perfect for my style of writing. I tend to write smaller than average when taking notes. I think it may have something to do with my rather powerful glasses. What I can read perfectly, other tend to struggle. When I first tested the nib, it was scratchy. I asked Jim if he could make it smoother, and he went to work. Three tests later, it was gliding across the page. It is the perfect blend of smoothness, combined with the sharp lines and variation of a cursive italic. 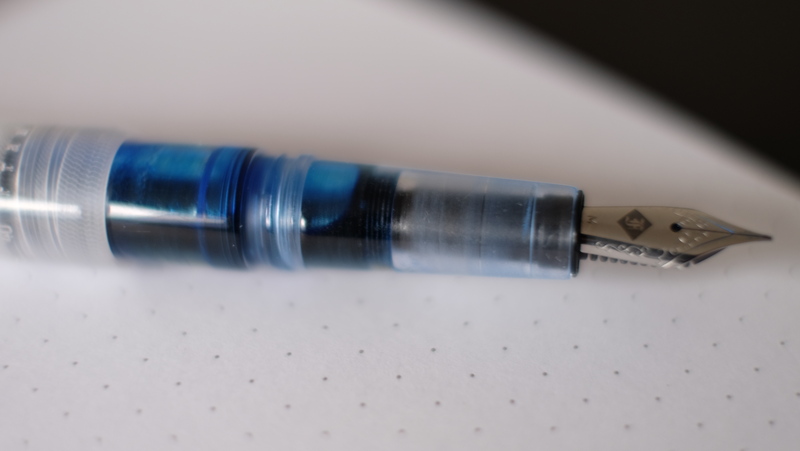 This nib is very forgiving, allowing beginners like me to easily adapt to writing with it. 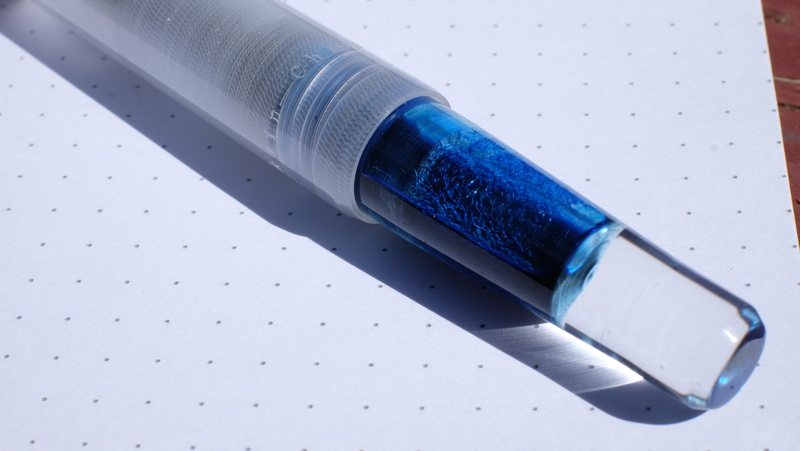 The “ice” texture is one of the greatest aesthetic assets of this pen. No matter what color ink you decide to use, it will look great sloshing around in the barrel if you’re using it as an eyedropper. As you can see above, this is one of the qualities that automatically drew me to this pen. The finial seamlessly blends into the main section. Franklin-Christoph now offer this part in many different colors. Some of them look really nice, and it became a difficult choice for me. I went with the Smoke color because it was the original color scheme that had bewitched me. The most annoying part of this is cleaning it. It is the biggest task I have undertaken, and it is very difficult to properly get all the ink out. 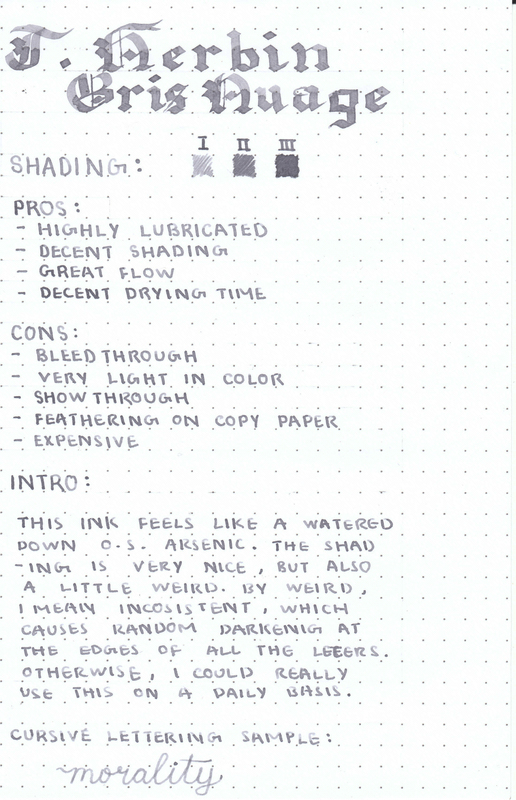 That’s why I suggest to not use an ink that tends to be difficult, like the J. Herbin 1670 series, Noodler’s bulletproof inks, or any pigmented inks. If you do decide to use these inks, make sure to use it up as quickly as possible, and put it in an ultrasonic cleaner (I used an electric toothbrush with some success). I would recommend this pen to everyone and their uncle. It is versatile, beautiful, and durable. It is the perfect balance between form and function. 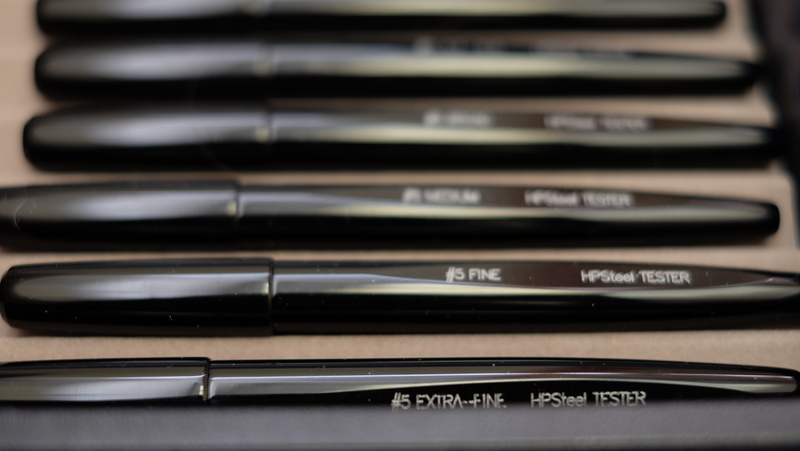 The HP steel nibs are a great value and perform nearly as good as the 18K gold nibs. Getting a nib ground by Mike Masuyama for an extremely small premium makes this pens one of the best purchases I have made. I know I said there would be a post this Friday, but sadly I couldn’t post it. For that I apologize, I was expecting a shipment, and I received it a lot later than I should have. While I could have posted on Saturday, I chose not to. Let me tell you why. Since I started my blog, the post I have been the most proud of has been my Vanishing Point review. I feel that to date, I have not taken photos anywhere close to the quality of the ones in that post. Well, my goal is to use the new equipment I bought to create an even more visually stunning review. So this entire week, I’m going to dedicate to the post that will be my piece de resistance.